The laid back, lounge-like vibe of the place seems to come naturally to Kyla, who was barefoot in a floor-length maxi dress. A fluffy white dog named Matisse moped around on the ground. And even though she’s from Texas, if Kyla threw on some enormous shades she’d look like a partygoer in Boogie Nights. 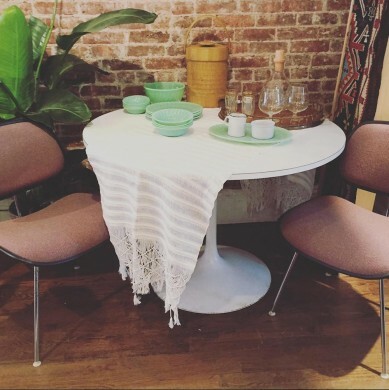 I could almost picture myself sprawled out on that reupholstered midcentury chair popping quaaludes, sipping on a daiquiri. And actually, this isn’t pure fantasy. With a “mid-range” price point, the only hard part would be finding the ludes. “I don’t stock anything crazy expensive,” Kyla confirmed. And though there’s a clear aesthetic, individual pieces reveal a diverse set of influences. Southwest printed blankets and rugs mingle with macrame wall hangings, and funky lamps sit atop sober-looking coffee tables. You’ll find plenty of practical stuff like barware and pottery, but you’ll just as easily find fun pieces like brass animals and a flamingo poking its head out from a framed photo on the wall. 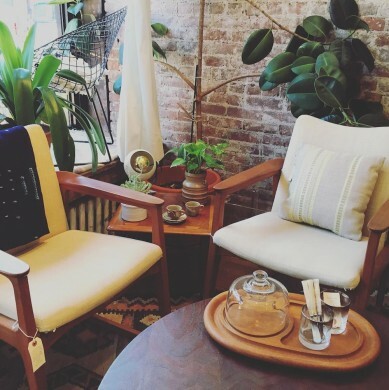 Adaptations is located at 109 Franklin Street in Greenpoint; hours are Tuesday through Sunday, noon to 7 pm.